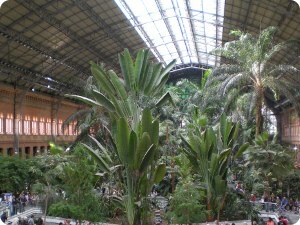 The Atocha Station is the largest railway station in Madrid (and Spain). It is the primary station serving commuter trains, intercity and regional trains from the south, and the AVE high speed trains from Barcelona, Seville and Valencia. Por example, in AVE train, you can go from Madrid to Valencia (and sea Mediterranean and beach) in just 1 hour and 35 minutes. At this site, Madrid's first railway station was inaugurated on 9 February 1851. After the building was largely destroyed by fire, it was rebuilt and reopened in 1892. The name Atocha has become attached to the station because of the nearby Royal Basilica dedicated to Our Lady of Atocha (Nuestra Señora de Atocha, in spanish). If you wish to visit this church, is located 300 meters (984 ft) from the station, on the avenue of the Ciudad de Barcelona, 1. The train platforms were partly covered by a roof in the form of inverted hull with a height of approximately 27 meters and length of 157 meters. The steel and glass roof spreads between two brick flanking buildings. In 1992, the original building was taken out of service as a terminal, and converted into a concourse with shops, coffees, and a nightclub. Like the Orsay Museum in Paris, the concourse has been given a new function, this time a stunning 4,000 m² (43,055 sq ft) covered tropical botanical garden. 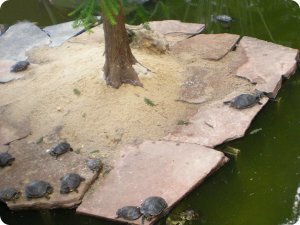 There are about 7,000 plants from 260 different species in the garden as well as a small lakes with freshwater fish (goldfish) and many turtles. Most of the plants are tropical species and a good number of them are palms. Some of these palms are so tall that they reach almost to the roof of the domed building. Daily: From 05:00 a 01:00. * Line 1 - Atocha Renfe station.